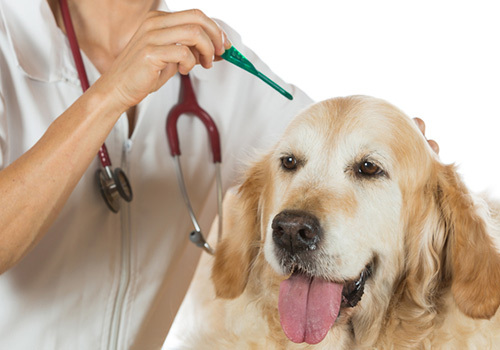 Other than being an obvious nuisance, fleas can cause (or facilitate) multiple medical conditions in your dog and cat. Though the same flea can live on both cats and dogs, fleas can cause anemia in young or destabilized dogs. A single female flea can take up to 15 times her body weight in blood over the several weeks of her adult life. In addition, fleas can carry several diseases, such as Parasitic Dermatitis, Cat Scratch Disease (humans), Typhus, and others. Likewise, fleas can also act as vectors to spread some of the most common tapeworms found in dogs and cats. Eliminating fleas from your dog or cat. Shampoos, sprays, powders, and spot-on preparations are all available. Be sure to consult with your veterinarian to choose the most safe and effective flea products for your pet. Controlling fleas in the environment. Though today’s environmental preparations are highly sophisticated, most products are only effective against the adult flea. Your veterinarian can provide you with flea products that contain Insect Growth Regulators that will help destroy the flea eggs and larvae. We recommend that you vacuum your carpet BEFORE APPLYING ANY ENVIRONMENTAL PRODUCT, which stimulates the pre-adult fleas to emerge from their protective cocoons. Likewise, be sure to discard the vacuum cleaner bag after use. Flea Eggs. Whitish and about .5mm in length, flea eggs are not likely visible without a magnifying glass. Eggs are laid by the adult flea after taking a blood meal. Eggs are first laid on the pet’s skin but ultimately fall off into the environment to continue the life cycle. These eggs represent approximately 50% of the total flea population. Depending on environmental conditions, eggs typically hatch between 14 and 28 days. High humidity and temperatures favor rapid hatching. Flea Larvae. Measuring 2-5mm in length, the larvae feed on organic debris found in their environment and on adult flea feces. While preferring warm, dark and moist areas, the flea life cycle thrives in today’s climate controlled homes. Indoors (and due to their aversion to light), larvae tend to move deep into carpet fibers or under furniture. Outdoor larval development occur in shaded, moist areas where flea infested pets spend a significant amount of time, such as in grass, near branches & leaves, and in soil. Flea Pupae. Flea pupae produce a sticky, protective, silk-like cocoon. The cocoon quickly becomes coated with grime and debris, simulating a useful camouflage. With warmth and humidity, pupae become adult fleas in five to 10 days. Now adult fleas, they can survive within the cocoon for up to nine months where they are resistant to insecticides applied to the environment. It’s important to remember that though you may apply insecticides in your home, the adult fleas may not emerge until well after the agents have dissipated (thereby not breaking the flea’s life cycle). The adults then emerge from the cocoon when stimulated by physical pressure, carbon dioxide, or heat. At this point, the adults can only survive when able to feed within a few days. Adult Flea. Unlike the larvae, the adult flea is attracted to light. Accordingly, it will emerge to the surface whereby it can encounter a passing host (i.e., food source). Two days after the first blood meal, female fleas begin producing eggs – up to 40 eggs per day and for as long as three weeks. The entire life cycle, from the egg to the adult flea, can be completed in 14 to 28 days, depending on environmental conditions. Clearly, consultation with your veterinarian – and use of the proper tools – is essential for flea prevention and disease control.